A powerful web crawler, Visual Web Task is advanced web crawler that parses HTML tags and extracts data and files ! 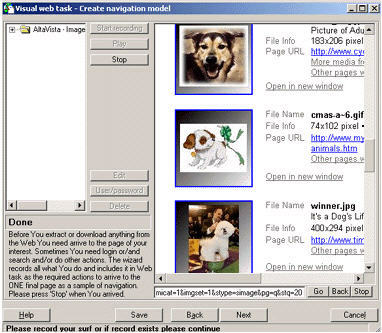 Web Crawler - Visual Web Task offers a very intuitive user interface, powerful visual parsing and ability to download just what You want, not a whole web site. Examples include extraction the music albums images from search results , list of available online jobs and many others. Businessmen can cut out the whole online business directories or verify prices of online stores. The extracted data can be stored in text files or ODBC databases , downloaded files can be saved on local drive. Web Crawler - Visual Web Task is a part of RNO 4.0 and fully integrates with all other parts of the development kit. Using office source code generator You can reuse the technology creating robust Visual Basic code and implementing your own HTML parser . For additional information please check out the full documentation .The best test results with Internet Explorer 5.5 or higher, Pls download Web Crawler - Visual Web Task to have a try !